Entertaining the kids in Garden Compound with my failed attempts at making toys out of cracker wrappers. Not pictured: the kids that saw me, a musungu (white person) and started screaming hysterically and running away, a reaction also reserved for rabid dogs. I haven’t quite found words to describe the dichotomy of Lusakan society, yet. According to The Economist, Zambia is one of the fastest growing countries in the world. In the same breath, the author says “[Zambia] is the worst performer by a distance at turning that GDP growth into greater well-being.” This article is worth a read, but what isn’t mentioned, is what failing to increase greater well-being actually looks like. It looks like gated homesteads on one side of a ten-foot wall, and trash bag tents cram-packed into a slum on the other. Huge growth is happening and quickly, but a wide majority of the population is struggling to stay afloat. In the middle of all this is hope. It’s overwhelming. The Lord is fervently pursuing an entire people, separate from any aid organization or any missionary’s plans. We’re just here to be hands and feet in a plan way greater than we can imagine. Something in these kids wants to take every opportunity we offer them, work hundred times harder than I think is a fair effort to even show up at school, and do that every. single. day. One tiny tyke strapping an even tinier tyke onto her back. A little guy strapped to his sister at Grace Community School, because she can’t go to school if she doesn’t bring him along. 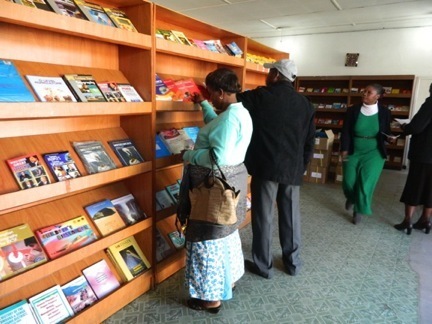 Pastor Peter (headmaster of Destiny Community School) with his wife Beatrice picking out school books at the Ministry of Education printing warehouse. I think Beatrice was doing most of the picking, but Peter negotiated a solid discount. Alissa and I watched uselessly during the book buying process. 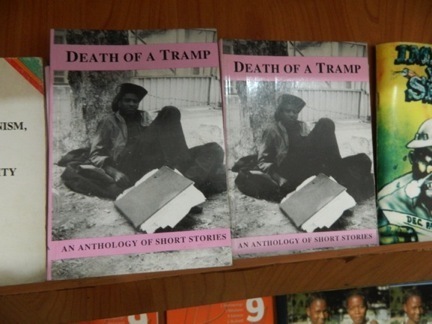 We tried to learn Nyanja from first year books…unsuccessfully, but we did find “Death of a Tramp, An Anthology of Short Stories” and other gems to entertain ourselves. Part of my analytical, engineering mind (read: every fiber of my being) wants to put an order to the chaos. So far, not so good. Car decimating road humps are placed sporadically, without warning, and without an obvious (or subtle for that matter) purpose. When the traffic is congested, the city’s solution is to just turn the traffic lights off which causes more chaos, but at least no one blames the traffic lights. When a mini-bus (glorified van, seating over a dozen people) breaks down in an intersection, the obvious choice is to send the scrawny conductor out to push at least twelve (much larger) people to the side of the road. We never did see how that worked out, but it didn’t look like it was going anywhere positive.